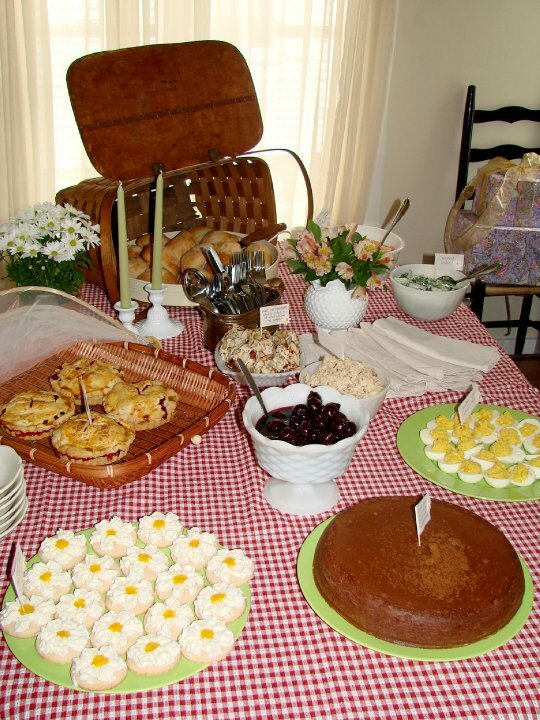 What is a picnic without scrumptious food? Not too long ago I had the chance to help host a little picnic in honor of a friend. Despite being rained indoors for the majority of the day, I managed to put together some tasty treats for the meal – because what is a picnic, if not all about the food, am I right? The first rule of thumb is to have as many delicious fresh things as possible, because picnics are a summer privilege and should really reflect it! 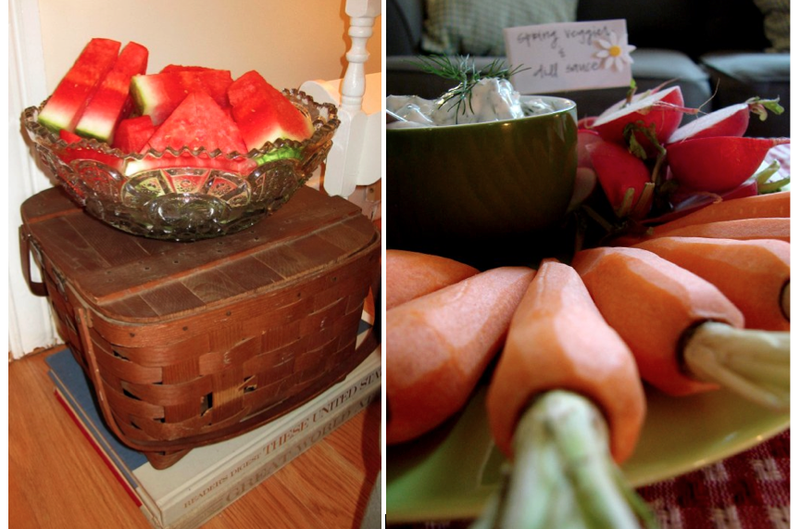 Thick watermelon slices and fancy cut crudités are a must. It is easy to throw together a “sauce”, or dip, with sour cream, dill, fresh ground pepper, and a little touch of mayonnaise to taste! Cucumber salad is classic fancy-picnic food. I am still in search of my favorite recipe for this, because too often the cucumbers lose their crunch! I don’t have a recipe worth sharing, but would love it if somebody else does! I thought the cucumbers were all right in this one, but still nothing to write home about, if we’re being honest. . . The Fruit Salad, on the other hand, is to die for! Throw together a combination of blueberries, grapes, blackberries, raspberries and pink grapefruit (peeled with the skin removed so its not bitter!) and you’ll never look back. IF you want to give it a little juicy push, you can also put about a quarter cup of organic fruit juice in. ALSO, they didn’t have pomegranates at the store, but pom seeds make a nice crunchy addition, too! Beverages aren’t hard to come by, but sometimes they make all the difference in rendering a simple picnic more elegant. 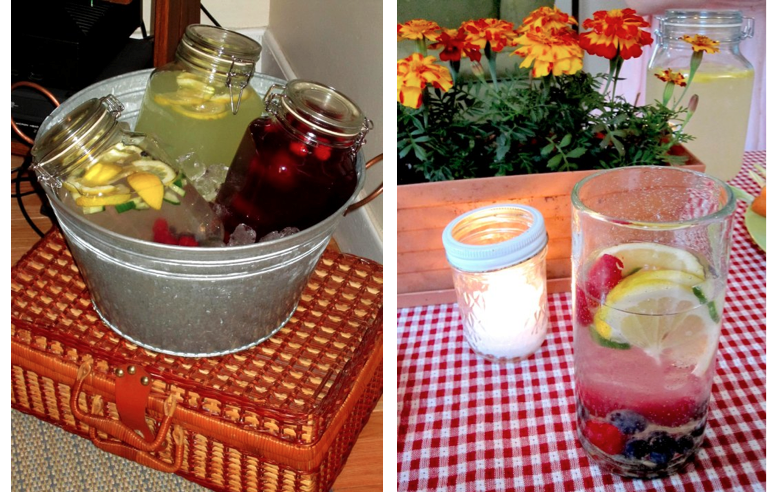 Nothing screams classic style like homemade lemonade, freshly brewed raspberry iced tea and icy cold water adrift with fresh fruits for flavor! Please also notice the flowers and candles. . . any incorporation of canning jar candles can be really fun, and if you do wind up outside, it’s a nice way to keep citronella candles around to chase away any buggies. A friend of mine introduced me to deviled egg variations a few years ago, and I was amazed at how delicious these could get. . . I”m not quite as thrilled with the less-than-stellar presentation of these particular deviled eggs (it comes out MUCH nicer looking if you pipe the filling in with a pastry tip!) but adding minced dried apricots and a dash of curry to the filling really does turn the flavor into something special! As for other foods, the small picture on the right shows a tray of skewered dates-and-gruyère (a pairing that was made in heaven, I’m 99% sure) and fresh mozzarella skewered with cherry tomatoes and a basil leaf from the garden! I also baked up some fresh rolls and we did a simple chicken-salad to go with them. Presentation-wise, you can always fancy-up your chicken salad with slivered almonds and red grape halves (make sure the grapes are pretty firm if you do this!). Vanilla Sugar Tea-Cakes are a shortbread-y cookie that came to me courtesy of Martha Stewart. I will have to locate the recipe for sharing, so if anyone wants it, just ask! My mom passed on a mean chocolate pound cake recipe, as well as some homemade cherry preserves. Add to that unbeatable combination a little vanilla bean ice cream, and the result is insanely perfect and classic delicous flavor. Blackberries are the unsung miracle of the berry world. They might actually be my new favorite particularly when it comes to baking and canning. So, it stands to reason that blackberry tartlets were also a tasty addition to the dessert party! These were also Martha Stewart inspired. . . click here if you’d like to see the recipe! All in all, the meal was an elegant success and everything tasted excellent, which means that it fit the wonderful company of my friends to a tea! This summer I think I’ll have to throw another picnic on a less rainy day! Any bright ideas for adding to my picnic menu?